Eating mindfully isn’t about resistance or restriction. It’s about enjoying more. Here’s a mindful-eating technique to use when you want a snack. We all eat mindlessly at times—whether we’re yakking with friends, in a hurry, watching TV, or finishing all the food on our plate just because it’s there. Or we might be eating to handle stress, gobbling down some comfort food but not really tasting it after the first few bites. Mindfulness is a powerful way to bring balance into every aspect of how we eat. It cultivates inner wisdom—awareness of how our body and mind are reacting—and outer wisdom—making wiser use of nutritional information to satisfy your needs and preferences. Use this approach at a snack time that occurs regularly and when you are alone, so you can fully focus on your experiences. You can then use these practices almost anytime you have an urge to eat. Here’s a mindful-eating technique to use when you want a snack. It could be late afternoon, when you’re tired, hungry, and perhaps have had a stressful day, or anytime you end up eating mindlessly. Use this approach at a snack time that occurs regularly and when you are alone, so you can fully focus on your experiences. You can then use these practices almost anytime you have an urge to eat. 1. Stop for a moment and bring your awareness to your breath. Slow down by taking two or three deeper breaths. You can close your eyes if you want. Tune your awareness into what is leading you to want to eat. Are you physically hungry? How hungry? How do you know that? Or are you just stressed—or bored—or perhaps you just got home and saw a box of crackers left out on the counter? There might be several triggers to your urge. Simply notice what they are. If you are physically hungry, give yourself full permission to have a snack. 2. Choose your snack mindfully. Consider what is calling you. What would be satisfying? What would you enjoy—to help you relax, bring comfort, or hold you over until dinner? Do you want something sweet, something crispy, something savory? Are the crackers still calling you, perhaps with a little cheese? Or do you really want some ice cream? Give some thought to this, because you will be more satisfied and less likely to eat more than if you’d just grabbed the first thing in front of you. 3. Use outer wisdom to consider how much to eat. One good rule is to eat about 100 calories per hour to sustain you until the next time you eat. That’s about how much your body will burn during that time, and it is a way to give yourself permission to simply enjoy your snack, rather than feeling guilty about it. So if the crackers are calling you, and there are two hours until dinnertime, figure out about how many crackers would equal about 200 calories. Or put the crackers away and help yourself to a small dish of ice cream. 4. Combine with inner wisdom. Savor the food, eating it slowly and without doing anything else. Pay attention to enjoying the food, to the pleasurable signals your mouth and taste buds are sending you. You’ll be surprised how satisfied you are from a smaller amount of food, both because you are fully paying attention (rather than also opening the mail or leafing through a magazine) and because you are giving yourself permission to enjoy this small amount of food. Pay attention to enjoying the food, to the pleasurable signals your mouth and taste buds are sending you. 5. Be flexible. Another day or another time you may want to try different techniques. Be curious and self-accepting. Bring these practices to other snack times, then gradually into meal times. Explore how the quality of your experiences of food and eating shift when you bring a mindful, accepting, and open awareness to them. 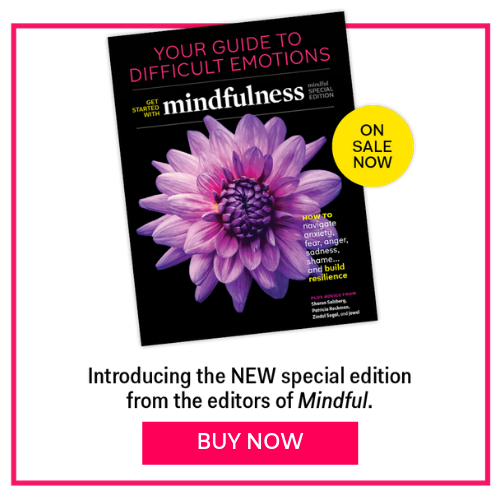 This article also appeared in the April 2014 issue of Mindful magazine. Jean Kristeller, Ph.D., a clinical psychologist, has used meditation-based interventions for eating disorders and obesity for more than 20 years, and has received NIH funding for related research for the past seven years. She has taught at Harvard Medical School, the University of Massachusetts Medical School, and Indiana State University, and co-founded The Center for Mindful Eating.